The Guild of Master Crafstmen I was awarded membership to the guild for the quality and service that I and my business offered. I was at that point the only florist in Scotland to have received membership. Opening Hours We work by appointment only when it comes to FREE Bridal consultations. Order for flowers can be taken over the telephone or through the website, where I can contact you back for further details. 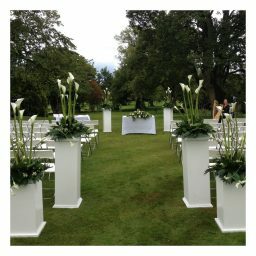 Wedding / Events Planner Service I offer a wide range of services including assisting couples planning their wedding or being their on the day offering a tailored service with regards to all floral set ups during the full day and working alongside venue staff to ensure the couples wishes are carried through. We also work with companies and charities to arrange events, providing knowledge, creative ideas as well as all floral requirements. We offer a hire service offering a range of items such as candle holders, vases, 5ft LOVE letters and coming soon all initials of the happy couple.